It is that time of year for soup. My husband asked me to make a pot of chicken noodle soup, so we can freeze a bunch of it. I got this recipe from my mom, and have been making it for years. She got the recipe from her Grandmother and had been making it for decades. But let’s be honest, it is nothing fancy, so I am sure your grandmother had the same recipe. 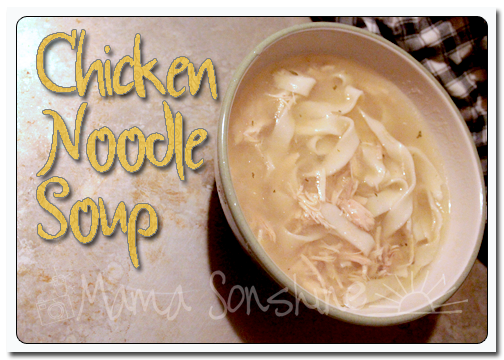 I love this recipe simply for the noodles. Seriously. Look at those noodles. Don’t you just want to eat them up right now? So doughy and creamy. When I first made these I rolled them out and cut them with a knife like my mom did. However they were as wide as the spoon I was supposed to eat them with. I had the pasta attachment for my Kitchen Aid mixer, so the next time I made the soup I remembered that I had it and used it. 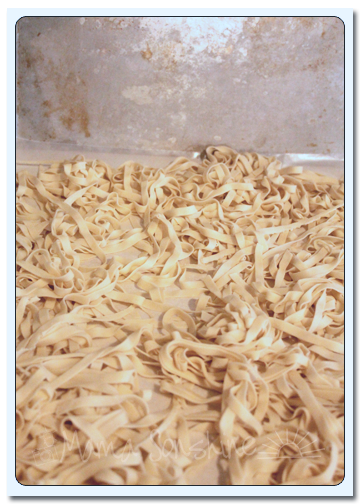 That time the noodles were too long…. 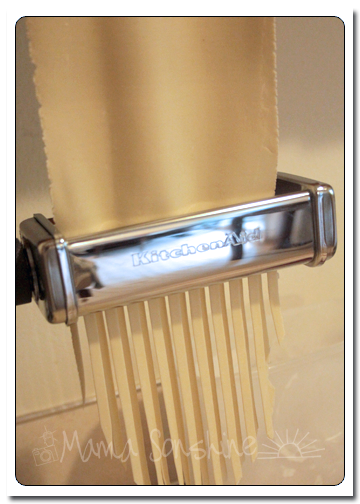 I have since perfected my use of my pasta roller/cutter. Wash chicken and place in a large stock pot with chopped onion. Dump in chicken broth, add water until you get desired amount of broth. Make sure the chicken is covered and remember the noodles will soak up some liquid. If you have added a lot of water, more than a quart or so, you can add a couple of chicken bouillon cubes so as to not dilute the flavor. If you don’t want to use chick broth, you can just use water and bouillon cubes; one cube per quart. Don’t want to use bouillon because of sodium? You can find a recipe here for a broth mix. Bring to a boil, turn down heat to med-low. Cover and cook for 2-3 hours. Beat eggs and milk together, add salt and flour. 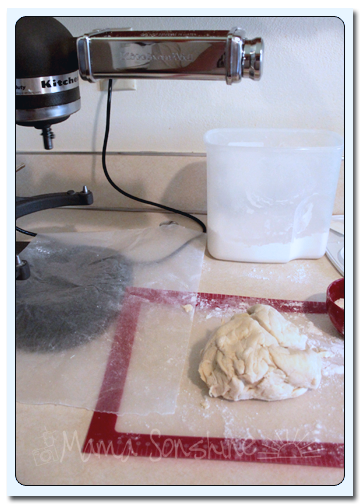 Mix until dough forms, add more milk or flour if consistency is off. 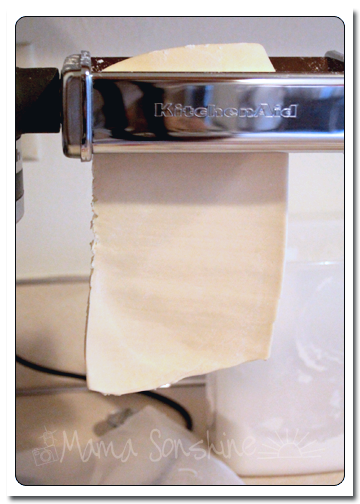 Roll out dough on a floured surface and cut into strips, then cut strips to noodle length. Let dry out a couple of hours while chicken is cooking. Remove chicken from stock. Allow chicken to cool, and remove meat. Shred meat and return to stock. Season with parsley, salt and pepper. Bring stock to a boil and add noodles. Cook until noodles are soft, about 10-15 min. Categories: Cooking, Food, Homemaking, Meal Plan Monday, Parenting, Recipes | Tags: Broth, chicken broth, chicken noodle soup, Chicken Noodle Soup Recipe, Chicken soup, Cook, cooking, Dinner, Homemade Noodles, Kitchen, Meal Plan, Meal Plan Monday, Meal Planning, Menu Plan, Menu Plan Monday, Menu Planning, Motherhood, Noodle, Noodle recipe, noodles, Org Junkie, Organizing Junkie, Plan to Eat, postaweek, Pumpkin Patch, Recipe, recipes, Slow cooker, Soup, what to cook | Permalink.